After my pathetic little appeal last time I wrote about the bathroom floor John rang and asked if I wanted him to bring his big spanner over. 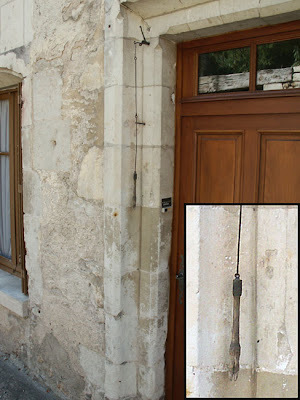 I jumped at the opportunity to get the bolts through the wall properly fastened (and the opportunity to survey their building works), so went to Bricomarche at Yzeures to buy my own spanner, picked John up on my way back home, and 10 minutes later the job was done. Next step was to put in the facing bearer. 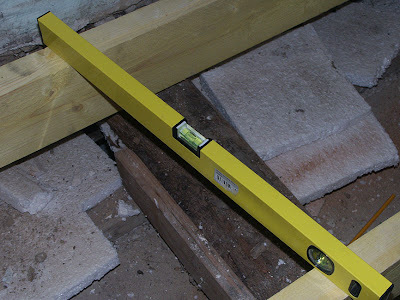 This was slightly problematic as the beam which I had planned to bolt it to wasn't level. (This means the landing isn't level either, but it's been that way for a couple of hundred years, so it isn't a problem.) Using a combination of angle and flat plates and some wedges it was the work of minutes* to get the bearer level and solid. This meant that when I put the spirit level across the gap between the bearers I discovered that the bearer on the wall was about an inch lower than the bearer on the landing. This meant removing the saddles already bolted to the ouside bearer and raising them. Working on one joist at a time I reset the saddles, and set the joists, continually checking on all angles the the frame was level. A couple of hours later and I was done: the joists are hight than the bearer, but I can remedy this by screwing another piece of wood on top of the bearer. 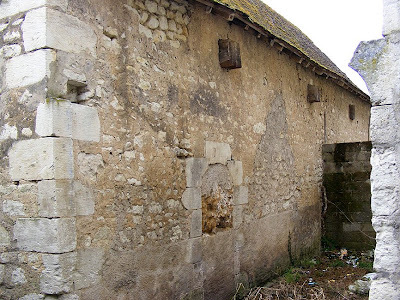 The next day, after lunch, I went to the decheterie, and on the way back called into bricomarche an collected three sheets of floor panels for wet areas. Cutting them to shape was difficult - there is no right angle or parallel walls in the room. I screwed the cut boards down, and suddenly we have a solid, unflexing floor. Compared to the Taj Mahal it may not look much, but I am inordinately pleased. This is the most proper carpentry I have done, and the first piece of structural work I have ever done. *Or should have been minutes. I work very slowly: because I have no idea what I am doing I check everything at least 10 times. 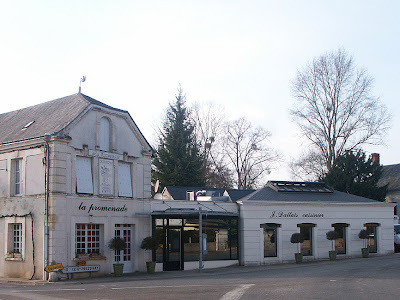 There are two restaurants in le Petit Pressigny. Stand in the right place, and you can see both at the same time. One has a Michelin Star, the other one does lunch for working folk. 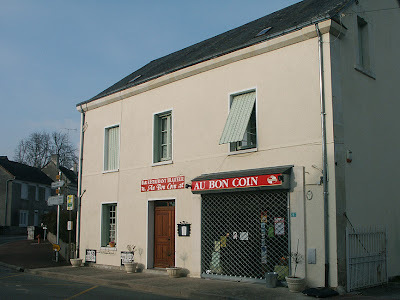 Our ambition is one day to eat in Au Bon Coin - we want to know what their garni is. 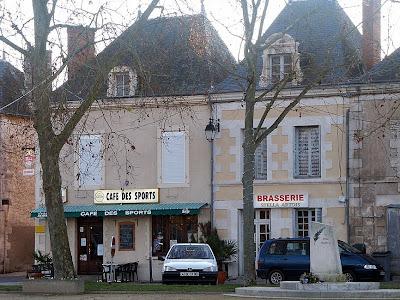 There are no prizes for guessing which menu goes with which restaurant, we thought we would just post these photos to give you an idea of your options if you're ever in this small Touraine village. You may recognise the devilishly handsome (if somewhat grubby, shaggy and disheveled) creature in this photo. We have shown a photo of the mediatheque before, now for an interior shot. When I first arrived this week I thought they had got rid of the printer. Not so - I discovered (but only after taking advantage of Jill and John's hospitality) that the printer has been moved to the librarian's office. I like using the mediatheque, but hopefully soon I won't have to. We are getting our internet connection sorted in the next couple of weeks. Hopefully. And now for some less positive news: When I arrived on Monday I noticed that our stone ball has gone missing. Whilst this is not the end of the world, it is the sort of petty thing that really annoys a bloke. Looking back at our photos it can be seen in the background at Christmas, but by February I can see (also in the background) that it was missing – just that neither Susan or I noticed. 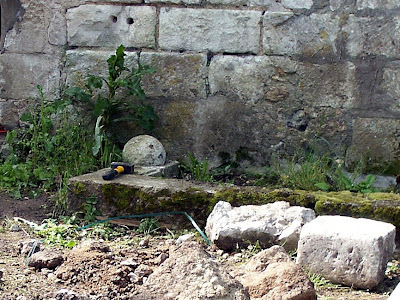 We have no idea how old or historic it was, but that isn't the issue – we liked our stone ball. When I arrived in Preuilly this week I was pleased to see that our phone book had arrived - and we are in it! This makes me feel almost a part of the place. Our recycling bags and black bags for poubelle (which are distributed by the council) had also arrived. Alan sorts all this stuff our for us while we are not here, which is really good of him - and very useful. I have been reading "Crap at the Environment", a book by comedian Mark Watson. It presents some interesting ways to be "aware" (BTW, I hate that expression! ): admit you're not perfect, try to do better, set yourself little challenges, don't try to force the world to change, you will only set people against you. It also helps that it is a funny book rather than a preachy one. I am interested in the environment - maybe not as interested as Susan is in things like birds, flies and orchids (I treat all them as a technical challenge to my photography skills), but I am interested. Over the years I suppose I have been been "green" (hate that too...) by default. Not because I particularly felt a burning need to save the planet (on which Susan will have something to say later), but because I honestly couldn't see any point on spending more money on electricity, gas or water than I needed too. I also would like for there to be polar bears (polar bears are apparently "fashionable") in the future. Not in an "awwww innit cuuuuute" way, but simply that I have never been hurt by a polar bear (yet) so I see no reason I should ruin a polar bear's life. 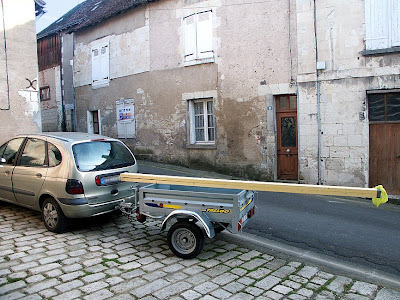 This is why Susan and I have been looking into environmentally friendly (or perhaps, more accurately, less environmentally damaging) ways of running our home in France. The biggie is, of course, heating. We have decided on aquathermie (using our well for heat exchange) if it is at all possible, or air exchange using a heat pump if our well is not sufficient. We will add to that a wood burning fire, and we intend planting a tree for each load of wood we buy. We already use low energy lighting throughout both our houses, we recycle, and as soon as we have a garden we will compost as well. I would really like to install a photovolatic system for generating electricity, but we don't have the roofspace for it. 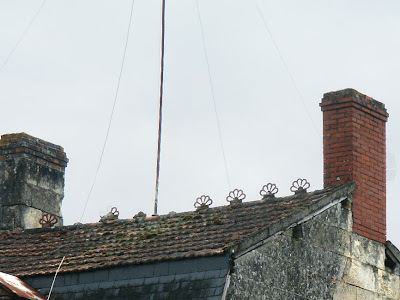 Or rather, we DO have the roofspace for it, but it's a heritage roof and we probably won't get permission. We will ask though, just in case. For the same reason we will not be able to do solar hot water, which is a pity. I love the idea of getting something (electricity and/or hot water) for nothing, even if that nothing costs quite a bit of money to initially set up. This doesn't mean we will be dirty greenie hippies. We intend living effortlessly stylish and elegant lives*, but always with one eye firmly fixed on not wreaking havoc. If you look up the meaning of miche in the dictionary, it will just translate the word as 'loaf' or perhaps 'round loaf'. But a miche is special. Making a miche is one of the black arts of the boulanger. A miche is nothing but flour and water and a little salt, which mixed together produce the most delicious loaf. It's like a magic trick and no added yeast and no energetic kneading required. This is the real French bread, with a centuries old tradition, unlike the baguette (French stick) which has not even reached a single century yet. To make a miche from scratch is not something you decide to do one morning in order to have fragrant crunchy fresh bread by lunchtime. To make a miche from scratch you need nearly a week. Admittedly, most of that time it is busy festering away for itself – you are not actually doing anything with it for more than five minutes of the first 4-5 days. 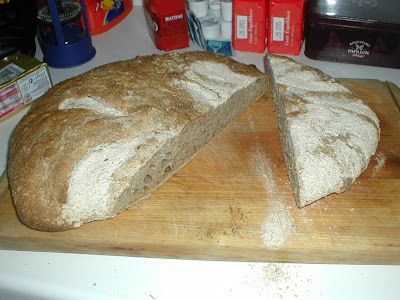 A miche is a wheat flour sourdough, leavened by mixing stoneground wholemeal flour and water together and set in a warm place to activate the natural yeasts present in the flour. Every day for four days you add a little more flour and a little more warm water. On the fifth day, if the mixture looks fairly active, you add some more wheat flour and warm water and this time, a little stoneground rye flour too. Rye flour has more yeasts, and helps the whole leavening process as well as adding some flavour. It is a misconception that sourdoughs pick up yeasts that just happen to be floating by in the air. The yeasts come as passengers on the wheat and rye grains, dormant and surviving the traditional milling process, ready to do their bit for mankind once the flour is mixed into a paste. 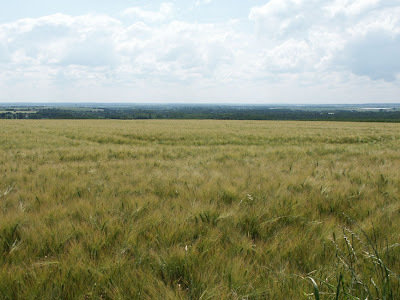 That is why you need to use stoneground flour, and preferably fresh and organic – modern milling discards the part of the grain with the most yeasts, and long storage causes them to go into a decline and never recover. The yeasts not only produce gases that cause the bread to rise but they also produce acids that modify the gluten in the flour, making it more elastic, easier to digest, more nutritious and changing the taste of the final product in an entirely beneficial way. 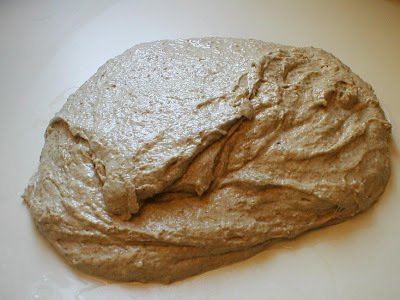 On the sixth day, put aside a third of your gently bubbling, ammonia smelling, grey, extremely unappetising flour and water paste and keep it in the fridge (so that the yeasts go dormant in the cold) to act as a starter the next time you want to make a miche. 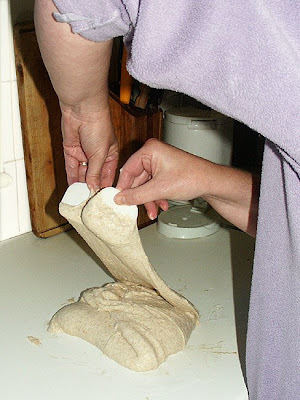 Add enough white bread wheat flour, some salt and warm water to the remaining two thirds of your active paste to make a very sticky dough. You should be able to just about pick it all up in one oozing bundle, but not be able to knead it. Sourdough needs to be wet, and needs a long cooking time to compensate for the extra liquid in the mix. Don't be tempted to add enough flour to make it easy to handle. You will end up with a brick, not a loaf of bread. Look at that gluten go ! Sourdoughs do not need to be kneaded. They are simply rested to allow the yeasts to act on the gluten, then you mound them up a bit and (traditionally) put into a flour dusted cloth lined basket to rise (or simply straight into an oiled loaf tin/pan if you are not making a free form country style loaf on a tray). Once risen (and it is surprising how much such an unpromising gloop can rise!) decant gently from the basket onto an oven tray lined with silicone coated paper and put in a hot oven. After 10 minutes, a reasonably strong 'crust' should have formed, and you can turn the oven down 20°C and bake for as long as it takes. If you check it after 40 minutes and you are not convinced it is done, put it back in for 10-20 minutes – it won't come to any harm. It is very easy not to give a sourdough long enough in the oven to dry out properly, resulting in gluey, stodgy bread. Every time you make a sourdough it will be different, because over time the proportions of flour and water in the starter will change, so the amount you add to make up the dough will change. You won't get the balance of flour to water quite right the first or even the second time. My first effort was too wet, but many people end up with too dry a dough. A few practice loaves are worth it though, because the slightly sour salty taste and chewy texture should be on anyone's top five list of comfort foods. 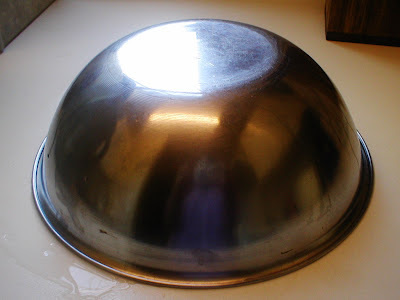 It also keeps well for days, gaining flavour, and with the acids from the yeasts inhibiting mould growth. 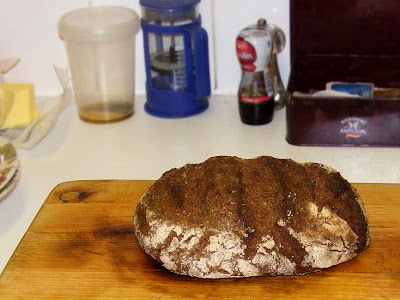 The loaf above is a mixture of rye, wholemeal wheat and spelt (an ancient variety of wheat that modern wheats are descended from), just because that's what I had on hand. It has a very hard crust and is quite dense and dark in colour, rather like the 'National Bread' during World War I must have been I suspect. However, far from complaining that it is almost inedible I quite like this type of bread – but I live in an age when wholemeal is good and healthful, not an indicator of poverty and subsistence. I used the instructions for French Country Bread in Andrew Whitley's Bread Matters, which I thoroughly recommend for anyone interested in making bread at home. Note: because les miches are normally round loaves, inevitably the word has entered the argot (slang) and so the word can indicate women's breasts or can be used like the American 'buns' for the cheeks of the backside. That all went better than I feared. I was so impressed with myself that I even managed to screw the saddles to the bearer. 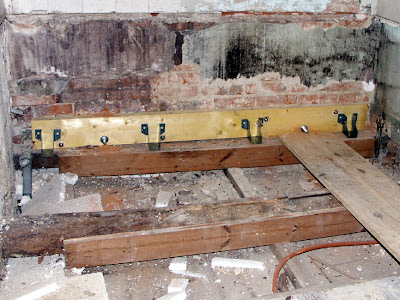 NOW I am confident the floor isn't going to go anywhere unfortunate while someone is in the shower. Even without the bolts being fully tight the bearer is solid. Pleased? You bet I am. In fact - I am right chuffed. 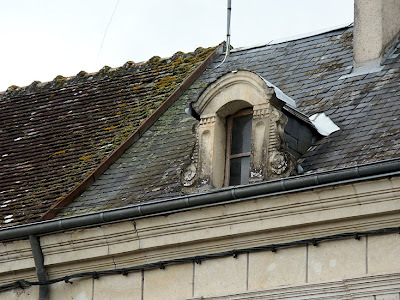 I am now back in Preuilly for a week or two, continuing with the works on the house, seeing Marie-Hélène at the insurance office, chasing up devis and squeezing in a cup of coffee or two with people who read the blog and are in the area. 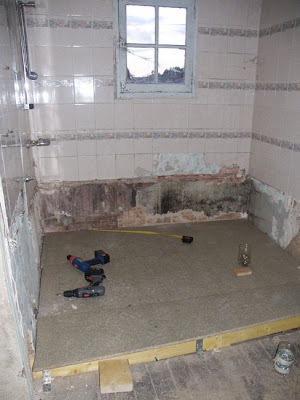 My first task (or, more accurately, the one that has been playing on my mind most) is the bathroom floor. After putting up the bearer last time we were here, I decided I wasn't totally confident in it. Although it didn't move, it felt like it could have done, and that isn't totally reassuring. 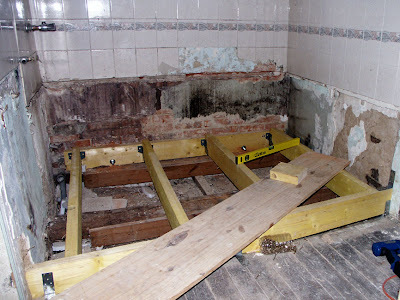 I don't want to be spending the rest of my life waiting for the bathroom floor to collapse (although the eight year old me sees that as a perfect excuse not to shower). After doing some reseach on the internet I decided that bolting through the brick wall with suitable steel braces on the outside was a better idea. was almost too late. Yes - it WAS tied down. My problem was that I now had to drill 16mm holes through wood, brick and steel - not an easy job when all your drills have 10mm chucks. 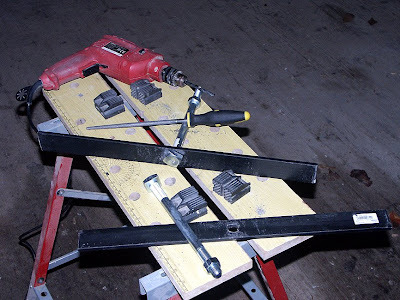 The solution (for the steel, anyway) was to drill a number of smaller holes then file them into one hole large enough to take the bolt. This took about 2 hours, but I am quite pleased with the results. The bolts pass through the holes without catching, and dont wriggle around, either. 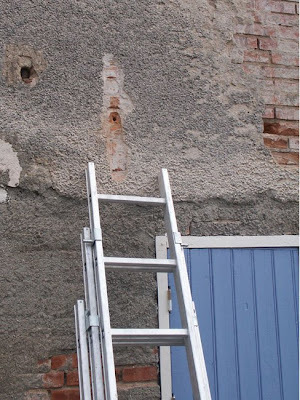 Now I have to drill the holes through the wood (easy enough, I have a 16mm bit) and brick (less easy, but I can mill away the brick until the hole is big enough), chip the render off the outside wall and then find a volunteer to stand up a ladder while I tighten the bolts from the inside. This will have to wait until tomorrow, as this afternoon (Tuesday) I am taking my first trailer load of stuff to the dechetterie. 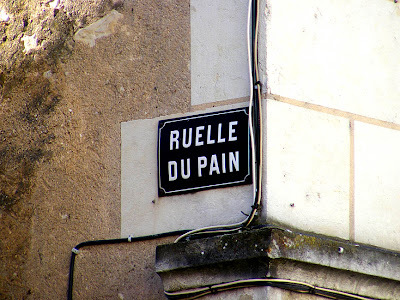 Ruelle du Four (Oven Lane) and Ruelle du Pain (Bread Lane) are opposite one another off la Grande Rue (Main Street) in Preuilly. 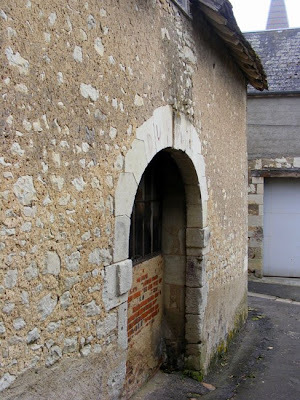 The Tourist Office is on the corner of Ruelle du Four. 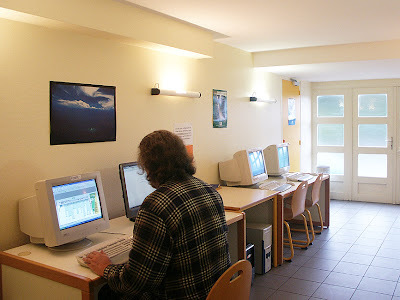 Mostly it just operates as a convenient billposting space, since it is only open to tourists in July and August. 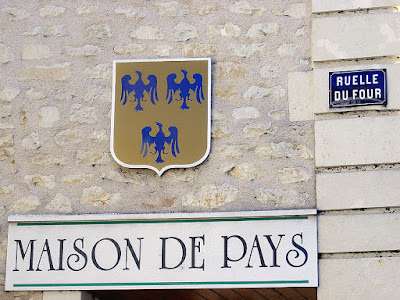 It is also signed as the Maison de Pays. 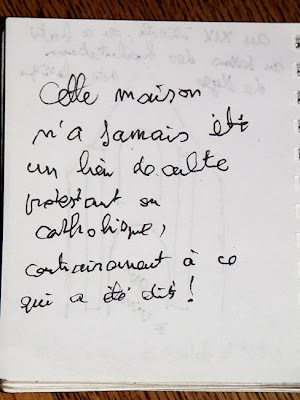 Maisons de Pays usually sell local produce and crafts. In Preuilly this seems to be limited to an annual exhibition by a local artist – last year a quilter from Bossay, the year before that a local photographer's pictures of native orchids. The crest displayed is the town arms, inherited from the old Baronetcy of Preuilly, once the Premier Baron of France. 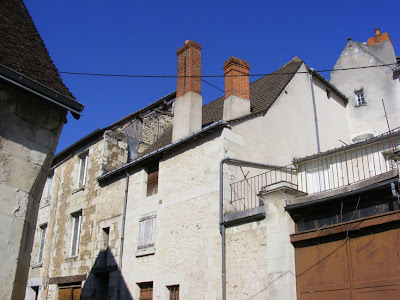 One day when we were visiting Roger Lezeau we happened to mention to him that we had seen a rather odd building at the bottom of rue de la folie in Preuilly. We couldn't work out what its function might have been. He immediately knew which building we must be talking about and drew a rough sketch of the front to confirm it. We asked him if it was the folly that the street is named for, but he said, no, the folly is prehistoric, and on the farm at the top end of the street. 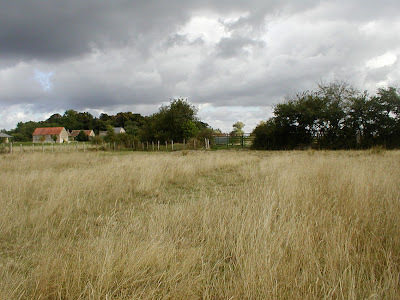 He told us the farmer had offered to sell the stones of the 'folly' to the local museum. Roger thought this was outrageous, as such things should be offered as a gift, to benefit everyone. 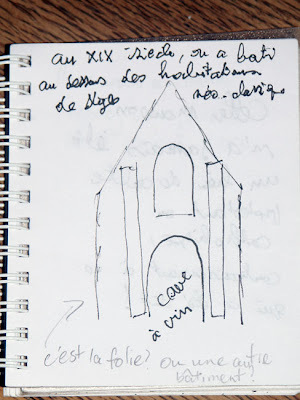 He told us that the building was 19th century, in the Neo-classical style, with accommodation above and a large wine cellar (cave à vin) below. He was particularly keen to dispel any ideas we might have that the building was a chapel, either Catholic or Protestant. 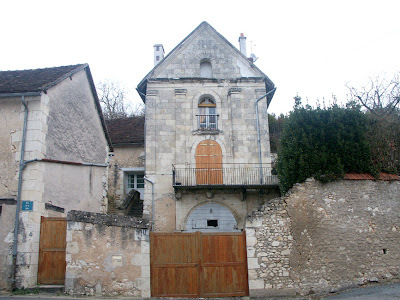 It sounded like there is a local myth about it being the long-lost (16th century) Protestant chapel of Preuilly and he was fed up with having to disabuse people. 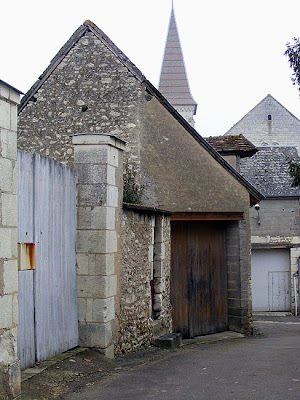 This garage in Preuilly sur Claise doesn't look remarkable - at first. The romantic me says that this was once a chapel - the practical me thinks it was probably always a barn. Whether it is from the 13th Century or the 17th century it is hard to say, but it is very much a vernacular piece. Everyone knows s'il vous plait – it is the 'SVP' of 'RSVP' on invitations. The 'R' is for repondez and the acronym exhorts you to 'respond if it pleases you' and yes, 'RSVP' is used in France by French people too. Even more commonly used is 'svp' in all manner of correspondence except the most politely formal, instead of writing the somewhat cumbersome phrase in full. Your bank will use it, the local Council uses it, friends writing a note to drop in your letterbox will use it. I don't think anyone just uses the initials in speech though – no point as the phrase in full is probably easier to say ('see voo pleh') than the initials ('esseh vay pbay'). 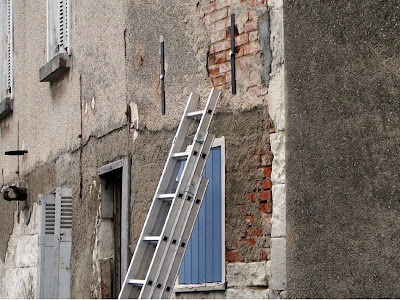 This was taken in the rue des douves on a bright morning in February this year. Except for resizing it, I have not change the photo at all. Usually I would have removed the wiring and made the colours stronger but one thing this photo didn't need was for me to play around with the colour - the sky really was like that. 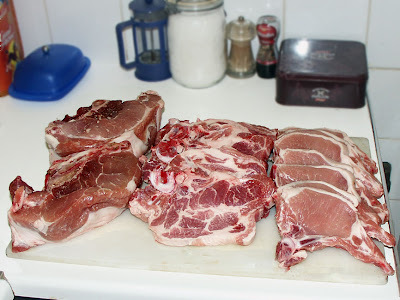 Recently I bought a pork loin economy bulk pack – porc longe sans filet mignon sans os caissette – so it came without a filet/ tenderloin and without ribs. This is one side of the mid-section of the pig, from just behind the shoulder to just in front of the hind leg. It weighed 4.2kg and cost €16.40 (€3.90/kg). There was no other information on the label, which makes me suspect that this is industrially farmed pork. I rarely buy meat that has no provenance because of the animal welfare issues, but on this occasion I needed to stock up quickly and affordably. I hope I have done justice to the pig. On the right are two loin roasts, sans skin, so no crackling potential, as is normal in France. I pot-roasted one in cider, which was not terribly successful (not enough collagen in this nice cut of meat to make slow cooking worthwhile). The other big piece I cured in brine and made into ham. This was outstandingly successful, and I am so chuffed with it, I will give it a separate post. The loin chops on the right we fried, and served very simply with steamed vegetables – quick and easy for after a work day. The big chops in the middle, from nearer the front of the beast, I jerked. Jerk pork is cooked for quite a long time, in two stages, so is ideal for these less prime cuts and I freeze it after the first stage of cooking, so it is a quick meal to prepare at a later date. Jerk pork (or chicken) is clearly a recipe from a time that didn't have the benefit of refrigerators. Not only do you begin by rinsing the meat in water acidulated by lime juice, but you then smear it with a strongly flavoured paste, full of ingredients that can give some protection against food poisoning or at least mask the smell of deteriorating meat. In modern times, washing the meat first has the advantage of removing all the little splinters of bone that you get with this cheap meat that has been cut with a bandsaw rather than professionally butchered. I have to admit that the recipe isn't in the least French though. 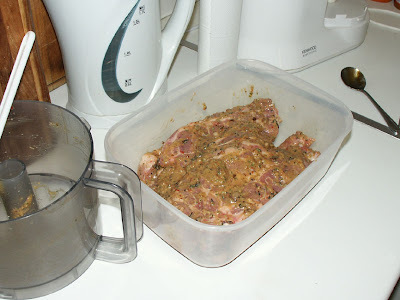 Below, pork chops marinating in the jerk paste, which is a mixture of salt, Ducros 5 Baies pepper, mace, cinnamon, onion, thyme, bay leaves, chillies, brown sugar, olive oil, butter, lime juice, powdered Lapsang Souchong tea and ginger. 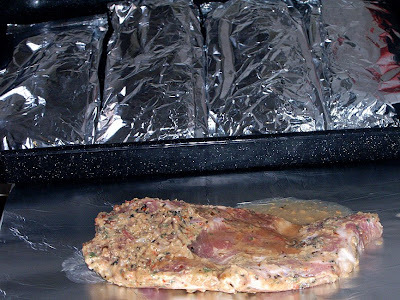 After overnighting in the jerk paste, the chops are individually wrapped in foil parcels and laid in an oven tray for the first stage of cooking – 30 minutes at 180°C. After this first stage of cooking the parcels can be frozen. To finish the dish, open up the parcels and cook for a further 30 minutes in the oven. This stage can be done from frozen. Serve with rice'n'peas (which I always get Simon to make). I am sure we are all in some way disappointed by the 21st century: I fully expected that by the time I was 40 we would all be wearing one piece tinfoil suits, travelling by jetpack and holidaying on the moon. There is one aspect of life that has changed amazingly, and that is the amount of information you get when you travel. Gone are the days of phoning an airline to confirm your seats and then just arriving at the airport some time before the flight left - now we check in online, and check the internet on the day we travel to make sure our airline is still solvent and leaving on time. On my first trip overseas (1977) I spent 3 months in Europe totally insulated and isolated from anything that was going on in Australia because British newspapers just didn't mention the place - now we can check the news anywhere and at any time. I went to post offices and booked really expensive phone calls to my parents - now we have mobile phones, email and text. 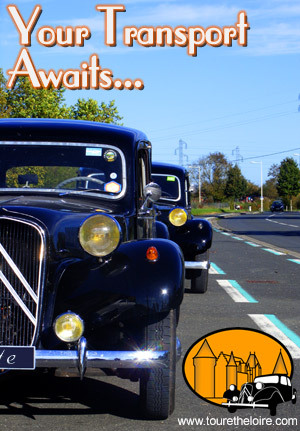 But those of us left at home needn't feel left out of the travel excitement. Susan left for Australia on Tuesday, flying to Sydney with Asiana Airlines via Incheon airport near Seoul. As her flight left Heathrow I was able to follow its path using Flightstats.com. This gave me all the info that the display inside the plane shows. Unfortunately, I wasn't thinking quick enough to get a shot of that, including the flight map when it was happening. 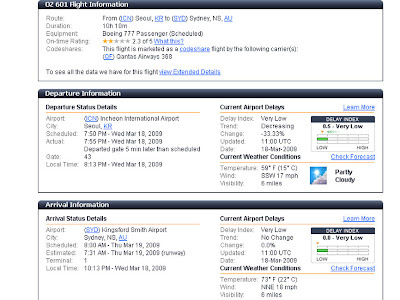 This is a shot of the information for the second leg of her trip. Going to the Incheon Airport web site I was able to check the arrivals board to see when her plane actually arrived (it was 12 minutes early) , and to check the departures board to see when her next flight departed. 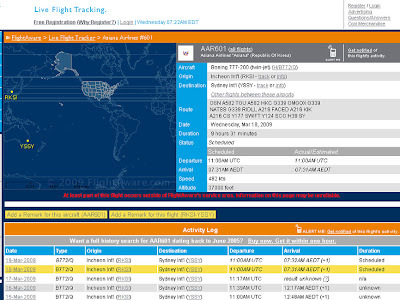 Once the plane had left Incheon, I was able to check Flight Aware to see how the flight was doing. 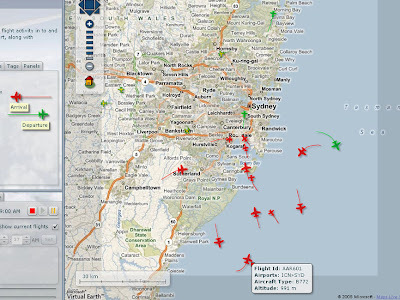 Yesterday evening I went to the Sydney Airport arrivals board to see when the flight arrived, and then about an hour after the plane arrived in Sydney I was able to see it on a recording of the Sydney radar system. 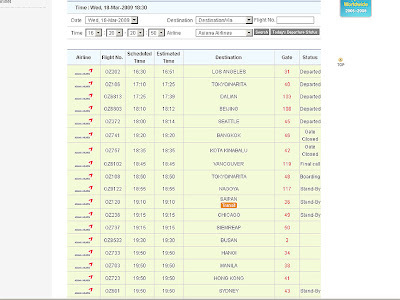 For real, recorded life thrills, you can go to this link*, uncheck the "show current flights" box, set the time for 07.27 am on 19/03/2009 and the speed at 10x to follow her flight in. 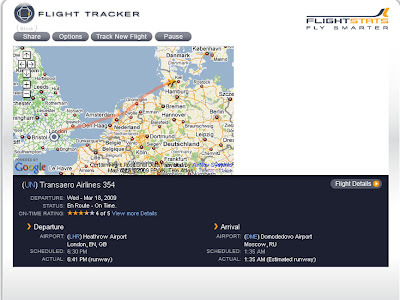 Hover your pointer over the planes to find Susan. OK. I will admit I am jealous. I like Korea and if I had gone with Susan we would have spent a week there on a layover. I spent a month teaching English at summer school in Seoul in 2005 and had a whale of a time. One day I may even post some photos in here. 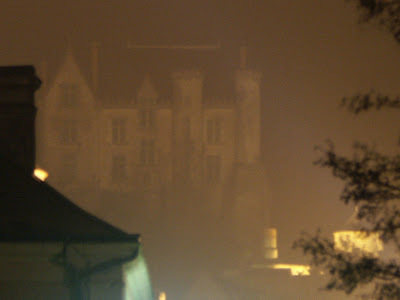 That will confuse anyone looking for pikkies of chateaux! 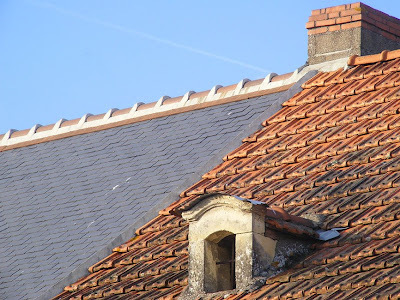 This started out as "dormer windows in le Petit Pressigny" - then I saw the ridge cresting in the third photo and thought it deserved a mention. This means we are back to roofing. None of these restaurants have the most inspiring façades. They do not encourage one to think that the inside will be a source of delicious and good value meals, served in an hygienic and welcoming environment. Don't be fooled, or worse, don't let the external appearance of these restaurants and those like them put you off entirely. Step inside and prepare to be won over. 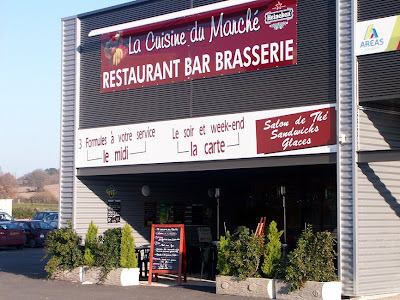 This is la Cuisine du Marché, which is at the end of a row of discount shops, and next to a large supermarket in the town of Yzeures-sur-Creuse. It is housed in an industrial shed, but the chef is popular and takes his job seriously. He comes out mid-service to greet all the diners, and josh and backslap the regulars. The place is busy every lunchtime with shoppers, road workers, foresters, farmers, teenagers in love, elderly couples, and expats who are renovating houses in the area. Unusually for a small rural restaurant, this place is not just a family affair, and has at least half a dozen employees, and the menu has a quite a wide choice. Note the blackboard menu, clearly on display out the front. 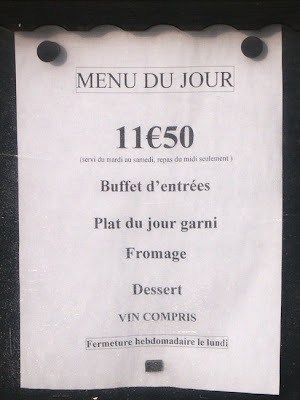 By law in France, all restaurants must display their menu and prices on the street, so you can make an informed choice about whether you enter or not. 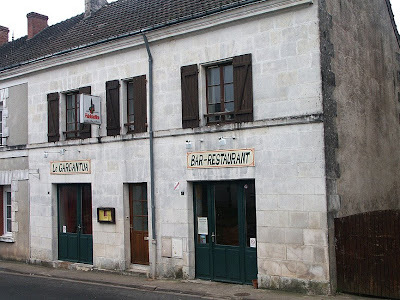 La Gargantua, in the main street of the village of Charnizay, is a fantastic little restaurant. Another one that is packed at lunchtime with local blue collar workers and farmers, it is run by a husband and wife team on their own (and run is the operative word – he cooks and she literally runs around the tables serving when they are full). 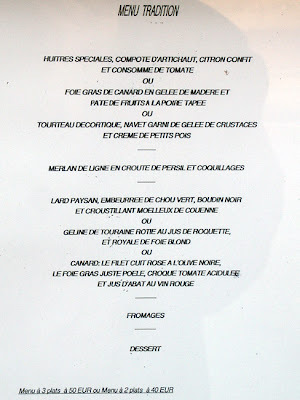 The lunch menu does not give you a choice, but the evening meal does – see the yellow menu in its display case on the wall. Le café des sports on the market place in Bonneuil Matours has not had a refurb for quite some time, and the clientele can look a bit rough and ready, but the food is traditional, very cheap and tasty. Again this is family affair, with him running the associated bar, her serving and a cook out the back. If lunch of an andouillette, duchesse potatoes and a pitcher of house red with îles flottantes to follow has not completely filled you up, there is a superb boulangerie / pâtisserie on one of the other corners of the market square. 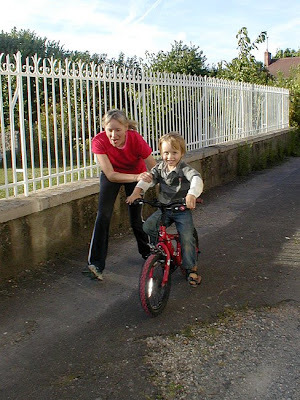 When our friends Carolyn and Adrian and their little boy Cory arrived in Preuilly in July, they brought with them a Cory-sized bicycle that they had bought at a car boot sale somewhere in England. For two weeks the grown-ups tested their aerobic fitness to the limits by running up and down the quiet driveways and tracks of Preuilly, keeping up with Cory and making sure he didn't fall off (well, too often, anyway). It only took him a couple of days to get his balance, learn to look up and ahead, and be cycling more or less independently, although he didn't realise this for a couple more days. It's not surprising that he got the hang of it very quickly, as his mum was a gymnast in her youth. 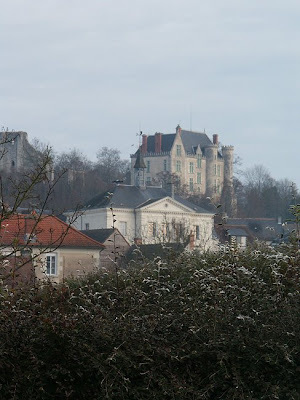 Three photos of the Chateau du Lion in Preuilly sur Claise. 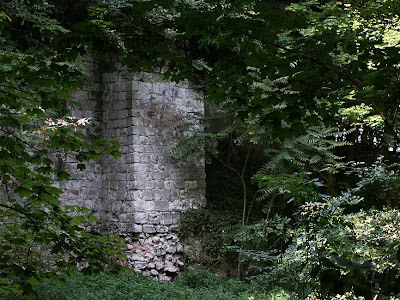 The second photo is of the large defensive walls that prove that once the chateau was a proper castle, and the third was taken on Christmas eve, 2008. Over the next couple of months you may notice us not blogging quite as voluminously as in the past - and the posts might be of events past we are catching up on. We will be attempting to blog every day, but the combination of Susan being in Australia for a couple of weeks and me pretending to be a builder means that sometimes we won't have time to think - let alone type those thoughts into the computer. A couple of weeks ago I wrote about door knockers and Nick commented that he has a tasteful arrangement of a bell with a string for callers to waggle. I think his arrangement may look something like this - but maybe with a less (chooses words carefully here...) rustique bellpull than this one seen in Preuilly. You may have to click on the photo to see it in its full gory. *"Pulling my chain" is an expressing that means to "take the mickey". As in- "he's pulling my chain" or "he's taking the mick". I have a feeling this explanation may not have helped some people, so less colloquially, it means to try and provoke a reaction - usually a fairly explosive reaction. 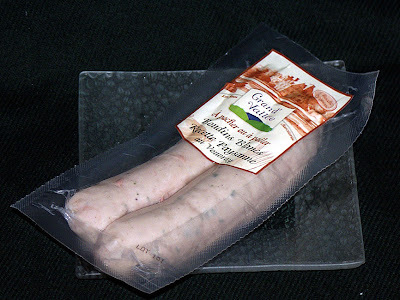 Boudin blanc is a very popular traditional style of fresh sausage, made with either poultry or pork meat. The label on this pair say that they can be poached or fried, and the recipe is a country style one from Vouvray. On the back the label listed the ingredients as: 46.7% pork meat, milk, pork fat, potato starch, onion, salt, whole eggs, 1% Vouvray (a local white wine), parsley, spices, antioxidant, natural pork intestine sausage skin. It also tells me that these sausages were made in Josselin, on the other side of Tours to Vouvray. I chose to start these off by poaching, then popped them under the griller to give them a bit of colour. They turned out very well, and were very tasty. The Blog Will Not Be Banned!